"We are in Cairo and have no plans to return to Israel sooner," Israeli tour guide and Arabic teacher Amos Abidov said Sunday while leading an Israeli tour group visiting Egypt. The group, which includes 30 students, traveled to Egypt on behalf of Yambateva Tourism Company and the Israeli Diwan School for Arabic studies. The school, headed by Abidov, takes the students on trips twice a year to get to know the Arabic culture and language. The group left Israel last Wednesday, as the riots began in Egypt. 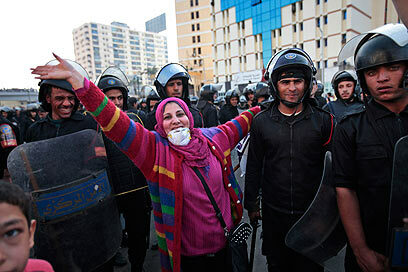 "Even though we heard about the riots in Cairo, no one canceled or feared anything," said Abidov. They are expected to return to Israel by planes on Sunday night and on Monday. An El-Al official said the Sunday fight from Tel Aviv to Cairo will leave as planned on 7:50 pm. How are other tourists from other countries feeling? "I ran into a few tourists from other countries and they feel as we do: They take pictures with tanks and people in the background. It was important to me that this trip wouldn't have anything to do with these events." How do you travel in this situation? "We go out to restaurants, take taxis, sit in cafes. We try to get to know the people here. We're currently heading towards the Egyptian museum, hoping it'll be open." Where have you been to so far? "Cairo, the pyramids, Cairo Citadel, markets and we also took a cruise along the Nile towards the Delta." Do you recommend Israelis continue to travel to Egypt these days? "We're not adventurous and the people here are educated with life experience and they're not looking for bad adventurous. The Egyptian people are truly nice to us. We're in the midst of Egyptian history in the making. I don't think Israelis have anything to fear." See all talkbacks "Israeli reports of 'friendly atmosphere' in Cairo "